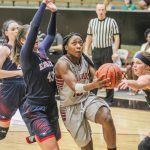 Coming back from a four game losing streak, the University of Indianapolis women’s basketball team defeated the Oakland City Mighty Oaks on Dec. 9. The win was only the second home game of the season, moving the team’s record to 2-8. Both senior guard Martha Burse finished the game with 24 points, three assists and seven steals. 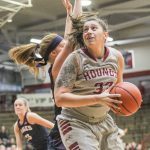 The teams kept the score close until the second quarter when senior forward Ashley Montanez went down with an injury, leaving the one-point game. Freshman guard Taylor Drury stepped in as a substitute. The Hounds answered back, scoring 13 points to the Oaks’ five, ending the half with a score of 34-25. Into the third quarter, the Hounds built upon their lead, scoring almost twice as many points as the Oaks in the third. Despite the Oaks outscoring the Hounds 8-6, UIndy came out on top 60-42. 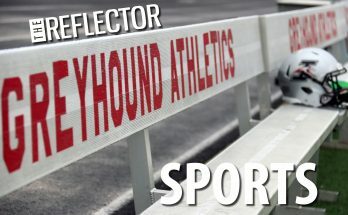 Earlier in the week, the Hounds lost to the Lewis University Flyers 65-49. The Flyers kicked off the scoring less than 20 seconds in with a layup. The Hounds trailed closely behind, before evening up the score at 18 to end the quarter. In the second, the Hounds took the lead and kept it until the top of the third, when Lewis took the lead. At the end of the quarter, junior guard Alexa Bailey hit a buzzer beater three pointer to end the third quarter, putting the Hounds down 46-37. The Flyers did not let up in the third quarter, granting them the win 65-49. Prior to the loss to Lewis, the Hounds were defeated by the University of Southern Indiana Screaming Eagles, 73-66. 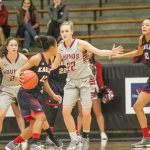 Despite USI’s undefeated record, senior forward Ashley Montanez said that the team came out with the drive to win, and did what they needed to do to execute that. The team began strong but lost its momentum throughout, according to Montanez. The Hounds led USI until the end of the second quarter when the Eagles caught up, taking their first lead of the game 28-27. After this, the Hounds fought to regain their lead, causing a battle. Two minutes into the third quarter, the Eagles came back and took control of the game. 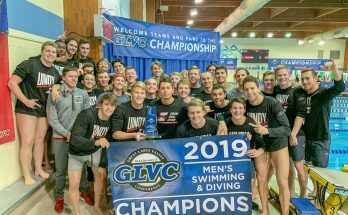 UIndy could not regain the lead, and the Eagles took home the win to make their record 8-0. Although the Hounds fell short, they outscored the Eagles more in the first quarter than any opponent USI had seen this season. is in her second year as head coach, and after learning about the team last year she has made some changes in terms of the team, practices and playing. 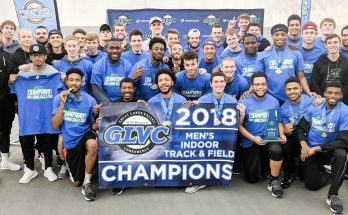 Montanez said that the goal of the season is to win the GLVC tournament. Last year the team made it to the semifinals before being defeated by Lewis. Wodrich said that this year some of the teams they play in regular season prepare them for a challenging conference tournament. 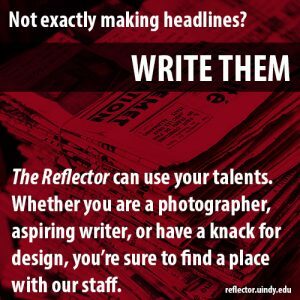 According to Montanez, the team lost many key scorers from last year’s roster because of graduation and other variables. This has forced the team to focus more on offense, and get many of the players up to speed on their shots. She said that since Wodrich began having the team shooting 200 shots a day, their scoring percentages have dramatically increased. Wodrich said that she is impressed with the team so far, despite their record. She said that the team has been working hard to stack up against some of their tougher opponents, and that they are improving, and playing well against more difficult teams on their schedule, such as USI. “You can’t look at the wins and losses, you have to look at the production and the process and how they’re getting better. So I’m pleased with that,” Wodrich said. Next, the Hounds will host Indiana Wesleyan University in Nicoson Hall on Dec. 14 at 6 p.m.